When you serve a meal that makes your kids say (and I quote) “I could eat this every single night!” you know you did something right. and it is served in one simple bowl (hello easy cleanup) then you’re basically high-fiving your own bad self. 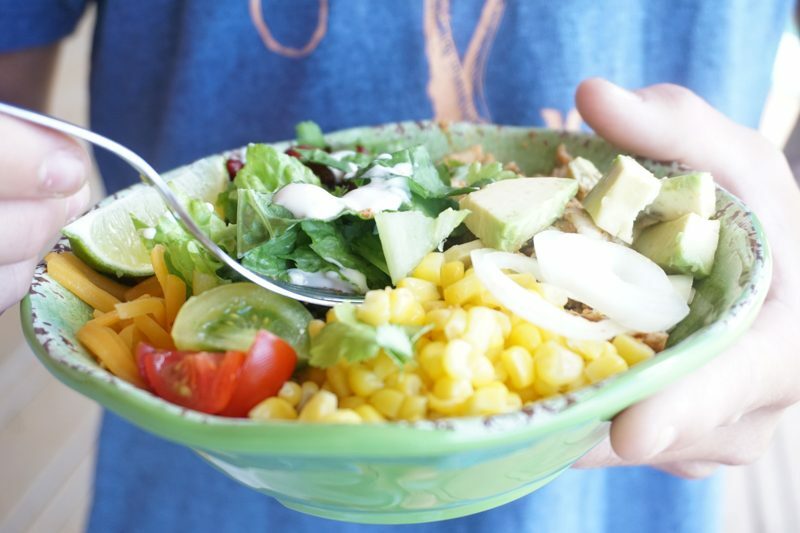 So let’s talk burrito bowls. I don’t know, call them what you like, but they are our family’s latest dinner obsession. 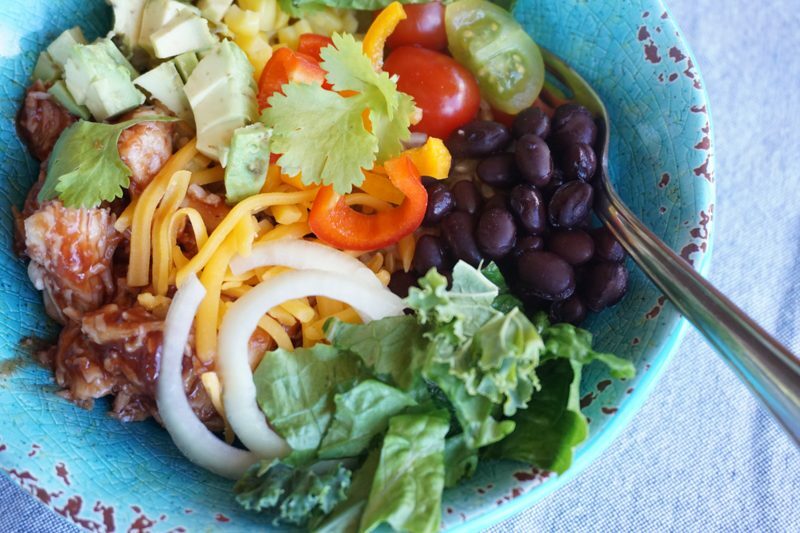 Bowls are the new burrito. Bowls are pretty much all of the ingredients inside a burrito, piled on top of a bed of rice (or other grain). 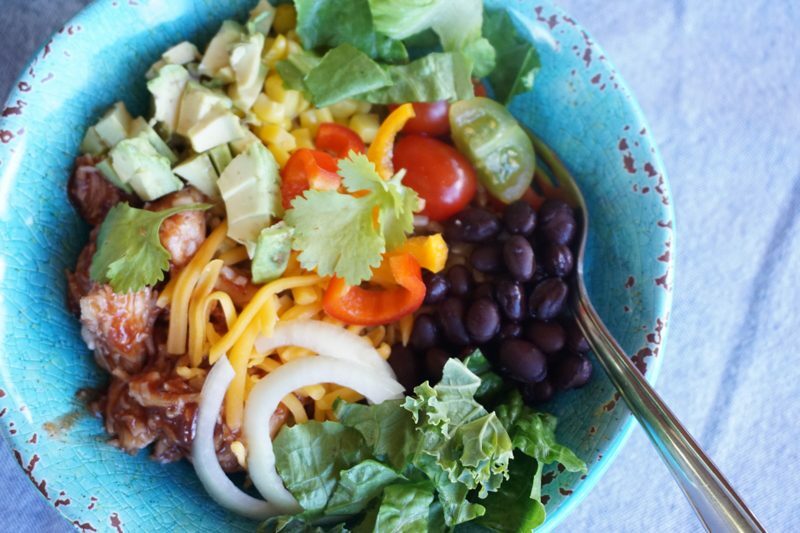 The key with burrito bowls (as with life,) is to have a few things prepped ahead of time. A rotisserie chicken can save you a lot of time, but I often just grill extra chicken breasts (or steak) to have on hand for such a time as this. I try to put rice in the rice cooker ahead of time so it’s ready and waiting. (though the packets of pre-cooked rice are nothing short of genius.) Also (for the veggie bowl) I baked sweet potatoes the day before, and refrigerated them to cube up and toss on the bowls. (and then kissed my self the next day.) 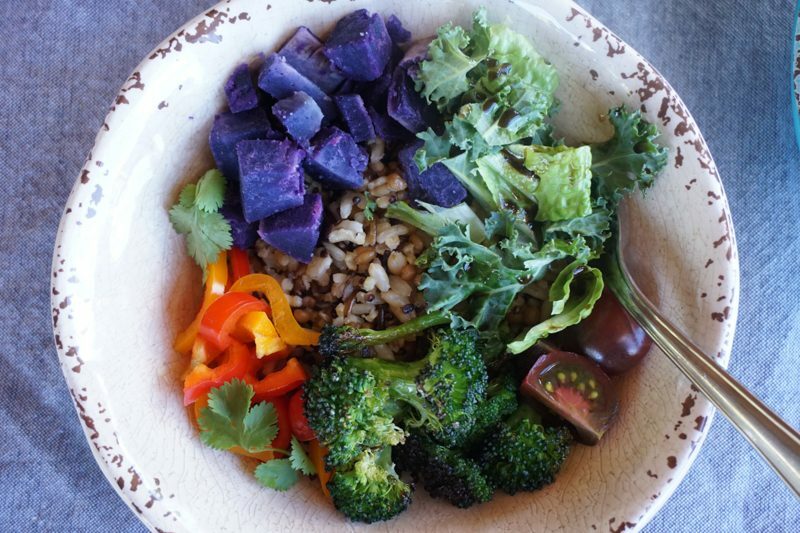 Most of the other veggies are raw, but there are no rules: I added roasted broccoli on the veggie bowl, and you could also toss on any other cooked veggies that you happened to have on hand. (the creative use of leftovers is a worthy mom-goal.) Even if you’re smack out of fresh anything–a can of beans, salsa, and some cheese will do the job. Bowls are boss, I’m telling you. 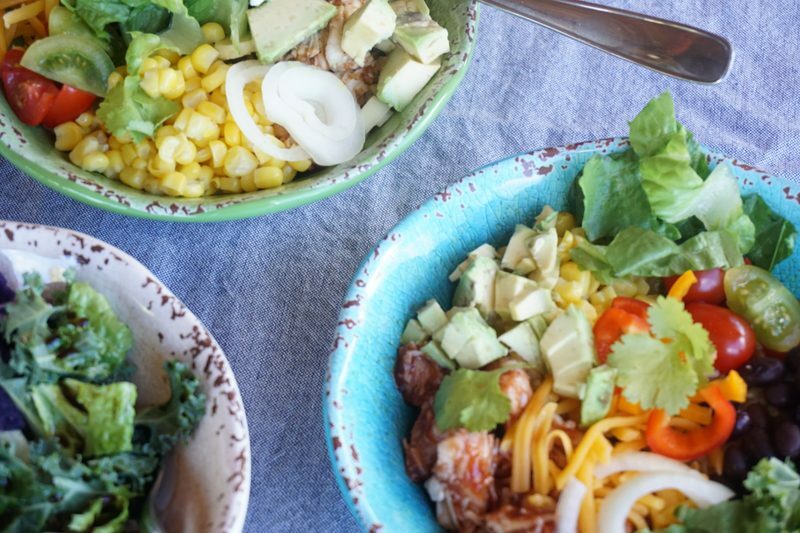 Today I’m sharing three of our favorite bowl combos, but the possibilities are endless. In fact, my favorite idea is having a burrito-bowl-bar, where everyone loads up with what they want to make a custom burrito bowl. Who wouldn’t want to come to that party? 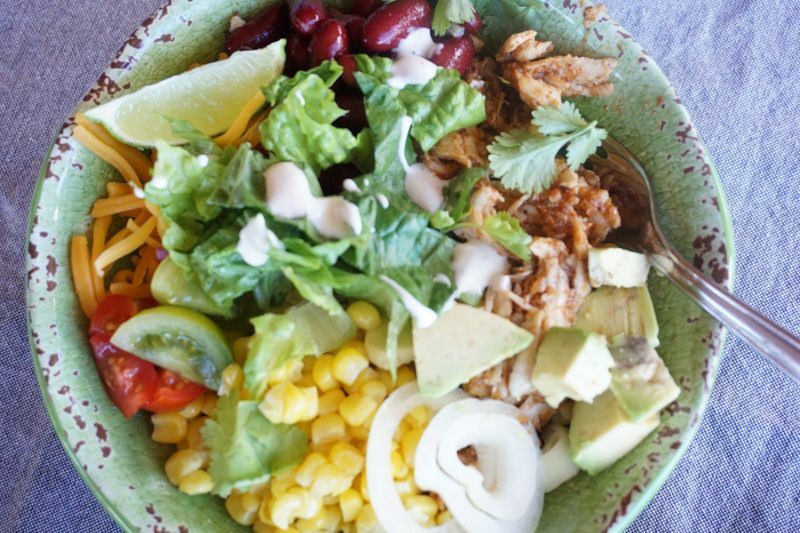 This chicken taco bowl starts with brown rice, and is topped with taco-seasoned shredded chicken breast, shredded cheddar cheese, corn (thawed from frozen,) sweet onion, tomatoes, kidney beans, romaine lettuce, cilantro, a drizzle of ranch dressing, and a lime wedge to squeeze on top. Mmmm. You know what else I love? These things are so beautiful to look at. I thought about framing some of these pictures because: that color! Healthy food is so pretty. Go make some bowls and make your family happy! If you are already a burrito bowl boss, I hope you’ll comment and tell us what you like to put on yours. If not then just talk to me about your weekend: Doing anything fun? Whatcha cooking? It was very hot in Cape Town today and I couldn’t think what to make for supper that was light and easy. Then I remembered seeing your post on the weekend. And I made a bowl with BBQ chicken, rice & quinoa, avo, tomato, cucumber, corn, broccoli and cheese. My three kids (7,4,1 yrs) loved it!! It will definitely be a regular. Thank you! Oh that makes me happy! 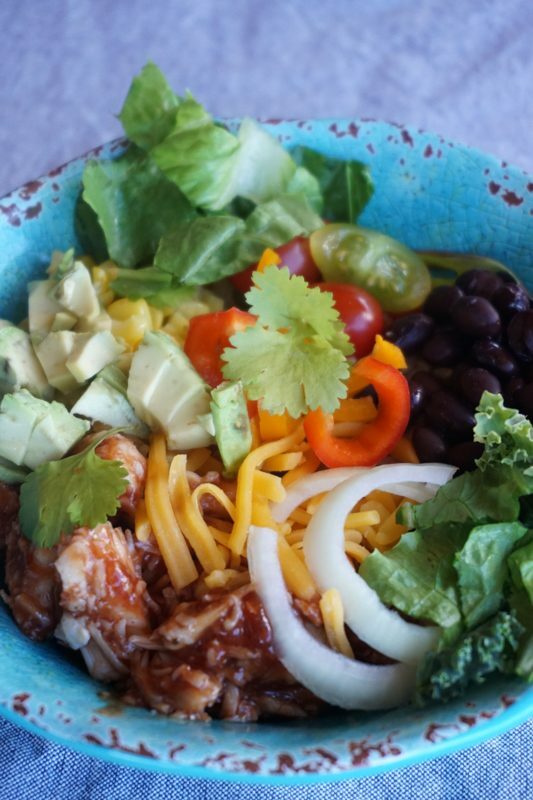 I just love that you can throw just about anything in a bowl and mix it up and it works!! Thanks so much for taking the time to comment. Blessings to you in Cape Town…(someday I will visit that area!!! :)) Aloha! So funny as I made these two days before you posted this! I have 3 boys (including an 8 wk old) and my husband was out of town for a few days. Trying not to throw the towel in on my normally healthy cooking which I love to do. 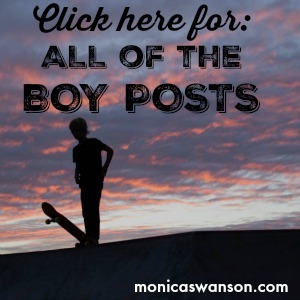 But sleep deprivation from night feedings and two other rowdy boys all day were making dinner and prep feel daunting. 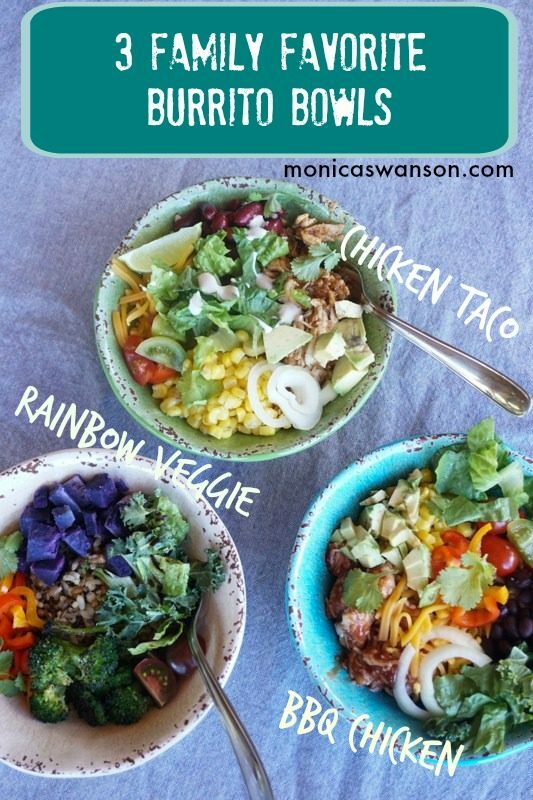 Somehow the idea for burrito bowls came into my head and same here…my kids loved them! 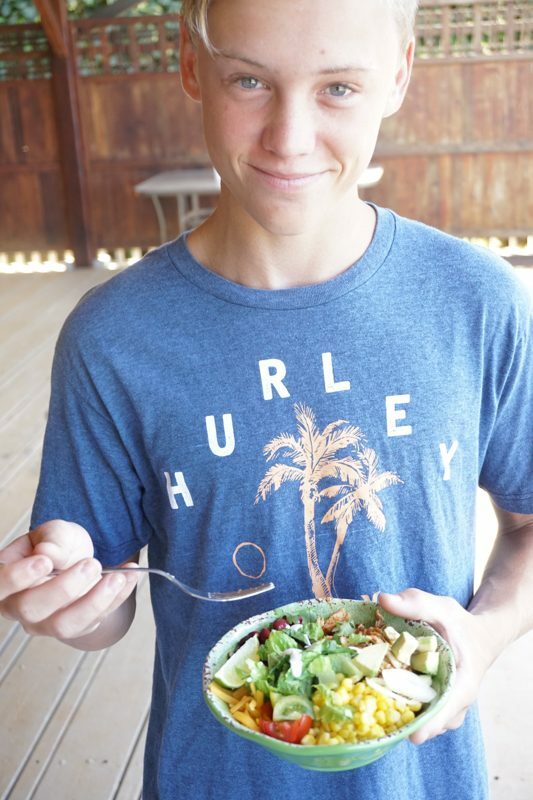 Serious win when it’s kid approved, easy AND healthy! We did shredded chicken which I had thrown in the crock pot…it only took 2 hours for a few breasts….easy with some olive oil and seasoning. I threw some brown rice in a pot and as long as you plan to have enough time for that to cook it’s mostly hands off. Then I opened a can of black beans, verde salsa (my fav) and did the frozen corn zapped in the microwave and cilantro, fresh tomato, cheese, and sour cream. 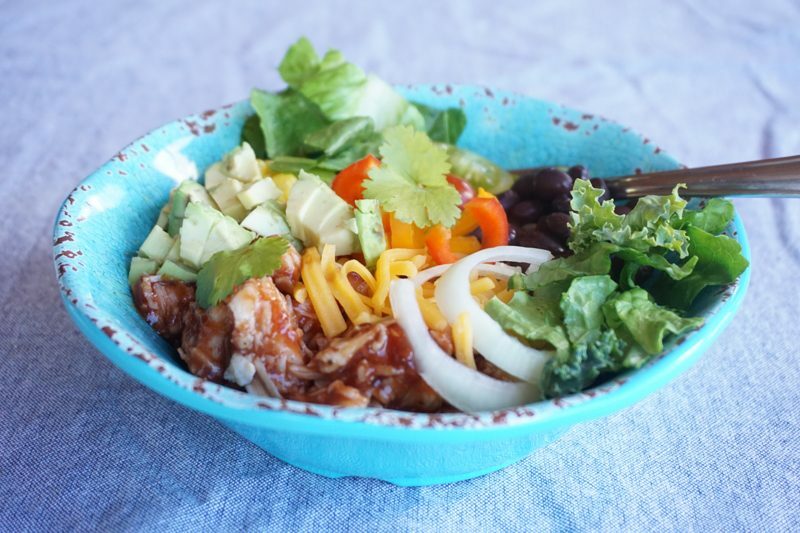 We love your bbq chicken salad…it’s become a summer favorite in my family…so I love that idea for a bowl. Also made me smile to see the purple sweet potatoes since we lived in Okinawa for a few years! Excited to have some ideas for other variations…will be a go to meal when Daddy is traveling! Thank you so much! I just added it to our menu this week! Oh good! I have no doubt it’ll be a hit. 🙂 (But I’d love it if you reported back, ok?) XO Aloha! Wow, these look delicious! Can’t wait to try these recipes. “Deconstructed” burritos. Less mess, less carbs! Last night we made your recipe for white bean chicken chili–again! The whole family helped to make it. We lined up while Tommy served it up in our bowls! We had fun. 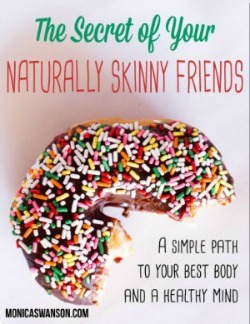 🙂 Thanks for your healthy, yummy recipes! Oh I love hearing that Wendy! Makes my heart happy. Glad to see you here, I need to find your email still and reply! 🙂 Much love to you and the family! These look great! I especially like the purple sweet potatoes in the vegetable. Do you also make or have recipes for poke bowls? Thanks Mark! My sons actually are the poke pros. They make poke using their fresh-caught fish> 🙂 I’ll have to share their favorite recipe sometime. 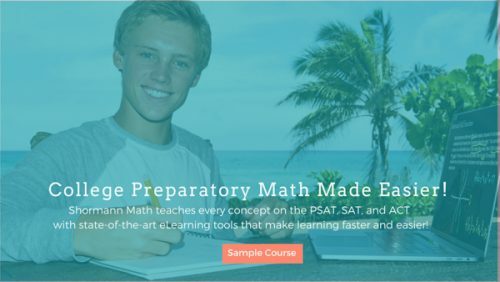 It’s really easy and so good!